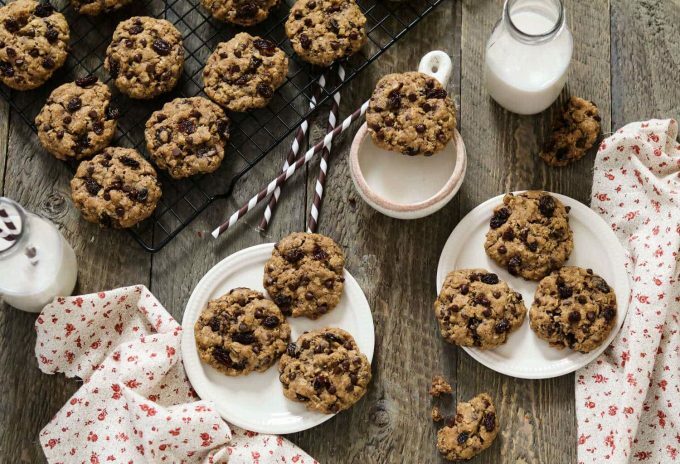 These vegan Oatmeal Raisin Chocolate Chip Cookies are tender, chewy, chocolatey, and deliciously sweet. It’s Friday, and it’s time for cookies! Not just any cookies, these are Oatmeal Raisin Chocolate Chip Cookies. A total classic! BUT, the difference is, they’re a veganized version of that old-time favorite. They are packed to the brim with heavenly sweet flavors…just like mom used to make. You guys have spoken, and I have listened! I’ve received quite a few reader emails lately, requesting a simple recipe for cookies. One that calls for easy-to-find ingredients, and uses a basic method. Many of the requests also suggested a plain flour, not a gluten-free blend. Even though I’m not gluten intolerant, I try to keep my intake to a minimum, but I still consume it. Moderation is key! When I first went vegan, I decided to make my favorite Oatmeal Raisin Chocolate Chip Cookies in a veganized version. The first batch was a success, and I’ve been making them ever since. The method is almost identical to the original version, so it was really easy. It’s mostly just swapping this for that. 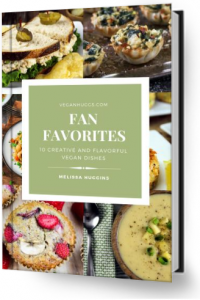 This recipe is straight forward, simple, and totally veganized just for you! BUT, if you are looking for a gluten-free cookie recipe, you can try out my Pumpkin-Peanut Butter Chocolate Chip Cookies. Now If you are just on the hunt for chocolate chips recipes, you can try out these Banana Chocolate Chip Muffins or my Chocolate Chip Pancakes. They are super delicious and chocolatey, too! No fancy schmancy ingredients here! Just simple, easy-to-find pantry items. You probably have everything waiting for you right now. The cookies will still be scrumptious. I prefer adding them though, because it yields a puffier cookie, with a chewier texture. Flax seed is great for baking, and is the perfect replacement for eggs. It’s super healthy, too. I love adding some to my morning smoothie. ~ Prepare flax eggs and set aside. ~ Line a baking sheet with parchment paper. ~ In a large bowl, whisk together the flour, rolled oats, baking soda, salt, cinnamon and nutmeg. ~ In a medium bowl, cream the butter, vanilla & milk together until smooth. Add the flax egg and combine. ~ Add the butter mixture to the large bowl and combine until a dough is formed. ~ Gently fold in the chocolate chip and raisins. ~ Roll dough into 1 1/2 inch balls, and place onto baking sheet. Bake for 12-15 minutes. ~ Remove from oven and let cool on baking sheet for 10 minutes. Transfer to a cooling rack. ~ Enjoy right away or store in air tight container. These aren’t some wimpy crumbly cookies that fall apart easily, and they will withstand some serious dunking! They are slightly crispy on the outside, with a tender and chewy inside. This is one hearty cookie, so go ahead and pour that glass of plant-based milk and get to dunkin’! If you make this recipe, I’d love to get your feedback. You can leave a comment below and let me know what you think. It would really make my day. You can also follow me on Instagram and share your creation with me. Just tag me @veganhuggs and hashtag #veganhuggs so I don’t miss it. Prepare flax eggs in a small bowl, by mixing together the ground flax & water. Set aside about 10 minutes. In a large bowl, add the flour, rolled oats, baking soda, salt, cinnamon and optional nutmeg. Whisk to combine. In a medium bowl, cream the butter, sugar, and vanilla together until smooth (*See note). Add the flax egg and combine. Add the butter mixture to the large bowl and combine until a dough is formed. Dough will be slightly sticky & slightly crumbly. If dough is too crumbly, add 1-2 tablespoons of vegan milk to help it stick better. Don't overwork the dough. Gently fold in the chocolate chip and raisins. Roll dough into 1 1/2 inch balls, (about 2 tablespoons) and place onto baking sheet. Bake for 12-15 minutes, or until edges are light golden brown. Don't over cook. They will look slightly undercooked on top & that's normal. Remove from oven and let cool on baking sheet for 10 minutes. Transfer to a cooling rack. Enjoy right away or store in air tight container. * I've made these cookies without the flax eggs and they are just as delicious. The flax yields a puffier cookie, and a bit softer texture inside. If you decide to skip the flax eggs, You may need to add a few tablespoons of non-dairy milk to the dough. If it's too crumbly, add a tablespoon at a time, until the dough sticks together. * You can cream the butter with an electric mixer or by hand. If you cream it by hand, just make sure your butter is soft before starting (not melty). Use the back of a long fork and beat the butter, vanilla, and sugar together, until, there's a creamy uniform texture and a lighter whitish-yellow color. Takes about 2-5 minutes. OMG, these are SO GOOD! I didn’t use flax, still great. ALso, I added a little tahini, less white sugar and no brown sugar. STILL great. Made into bars rather than cookies…STILL GREAT!!!!!!! I made these but used dates instead of sugar and one banana instead of butter. Nice! made these tonight, yum! only used the brown sugar – no white sugar, skipped the raisins and increased the choc chips. I was a bit confused as to when to add the sugar as its not in the instructions, I mixed with dry ingredients – later I saw sugar mentioned in the last recipe note, it was supposed to be with wet – glad it still worked out! I tried them with mixture of both flours. They turned Fabulous in looks as well in taste. Just wanted to ask how to measure calories in a particular product like if I baked a cookie. What calories it includes? Yeah, I read the nutritional value you mentioned hear for this recipe. But I’m asking in general how to find nutritional value in particular product. If I follow some other recipe of mine own. Please help me out if you can. Oh, I see. I use myfitnesspal.com. I feel it’s the most accurate. These cookies look delicious! I love the simple, straight-forward approach and the photographs look great! Awesome. My favorite type of cookies. Thanks. Any thoughts on swapping the vegan butter for coconut oil. Do you think that would work? I did a little happy dance when I saw this. These will be waiting for me after my long run this afternoon. Um oatmeal = healthy post-work-out. Right? I tasted one after they came out of the oven this morning and they were dreamy. Hi Hanne, oatmeal totally equals healthy post workout 😉 Thank you for making them. I’m so happy you liked them!